Despite the United Nations declaring housing to be a fundamental human right in 1991, homelessness continues to be a public health problem in the United States. A group of upper level public health students put concepts they are learning in class, such as socioeconomic factors that limit access to healthcare and barriers to affordable housing, to work and volunteered in a local community kitchen to ensure members of the homeless community have healthy food as they rebuild their lives. Students Maria Munoz, Alex Wiens, Timothy Terry, Roda Kassiba, Melissa Palacios, Eileen Meroneck, Moise Lambe, and Wilnelia Aviles with Dr. Claire Stigler, full time faculty member in Public Health and Dr. Seena Mathew, Program Director for Public Health volunteered with Caritas of Austin’s food program. In Austin, nearly 20% of households lack consistent and reliable access to nutritious food. The community kitchen helps build physical well being as people are transitioning out of homelessness. 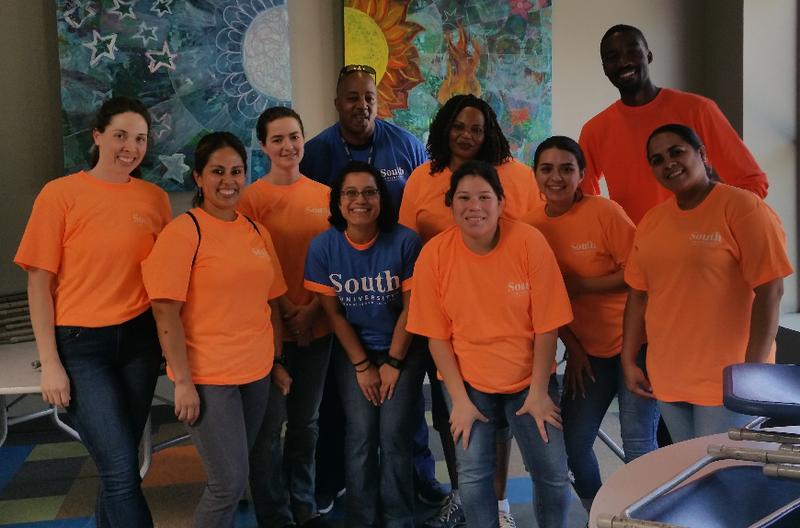 South University Austin students hand prepared and served lunch including fruit and vegetable salad, mashed potatoes, venison meatloaf and a sweet or savory pastry to over 250 members of the homeless community in the downtown Austin area. Students were also involved in creating care packages for members of the homeless community, which included soap, toothbrushes, toothpaste, and razors. Together these service help build a strong foundation as people work toward their life goals.